The Rio Abiseo National Park is home to a large number of species of flora and fauna, as well as the location of over 30 pre-Columbian archaeological sites. Since 1986, the park has not been open to tourism due to the fragile nature of both the natural and archaeological environment. 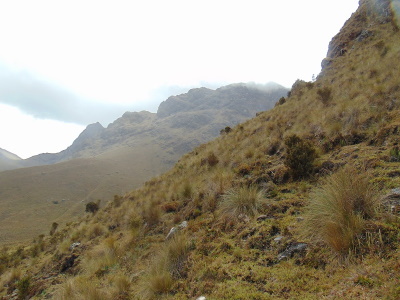 There are at least seven climate zones in the park, including montane forest, tropical alpine forest, montane rainforest, high Andean grasslands (puna), and dry forest. The Yellow-tailed Woolly Monkey (Oreonax flavicauda), previously thought to be extinct, is known to live in the park and appears to be endemic to the region. It was mostly due to this monkey's critically endangered status that the area gained national park status and was placed on the list of World Heritage Sites. The most famous archaeological site in the Rio Abiseo park is Gran Pajatén, a ruined settlement that has been occupied between 900 and 200 BC, and 200 BC-AD 600. This and other archaeological remains identified in the park are usually attributed to the Chachapoyas culture. My understanding is that the Rio Abiseo National Park is closed to tourism while a park management plan is being developed by Peru's Institute of Natural Resourses (INRENA) and National Institute of Culture. The natural environment and archaeological sites are extremely fragile. Lack of road access means that only backpackers will be allowed to enter, after paying a supervision fee. The archaeological sites and few points of access are all patrolled by park guards. Critically endangered fauna species: Yellow-tailed Woolly Monkey - "Fewer than 250 individuals are thought to survive today."